The sale comprised works from Surrealist painter Enrico Donati’s studio in the landmark Gainsborough Building on Central Park South. In his studio, Donati mixed Eskimo masks and kachina figures with his own work, works of his contemporaries, found objects, stones, fossils, and the mystical mandragora root to create an entirely new world, and a fountain of inspiration. The session’s top price was achieved by An Important and Rare Eskimo Polychrome Wood Mask, Yup’ik or Anvik, which totaled $362,500 (est. $300/500,000). 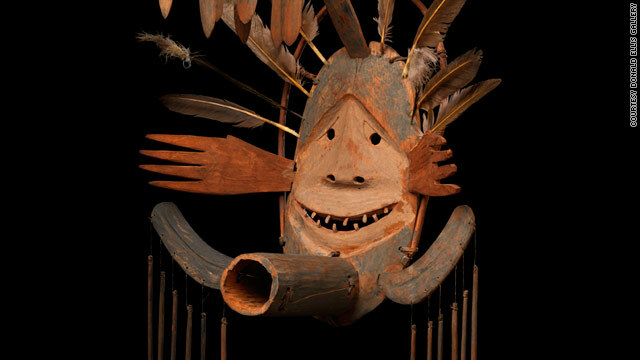 The mask would likely have been used for both festival dancing and shamanistic activities, however its specific meaning remains an enigma, the mystery of which is part of the strong attraction Donati and his Surrealist compatriots had for Eskimo art during the middle of the 20th century. In the mid-1940’s, Donati purchased two remarkable Yup’ik masks from the New York dealer Julius Carlebach, the man who supplied many of the exiled Surrealists residing in the city with the indigenous arts that so ignited their imaginations. He obtained most of his choice specimens from the collection of George Gustav Heye’s private Museum of the American Indian—the progenitor of the Smithsonian’s current National Museum of the American Indian. Like other museum directors at the time, Heye frequently deaccessioned items for financial reasons or exchanged objects deemed to be multiples. While Heye sometimes collected objects from their indigenous owners—he made several trips to Vancouver Island during the twenties and thirties, for instance—more often than not he purchased them from regional dealers or travelers to Indian Country. Two other masks Twitchell collected ended up in landmark exhibitions at the Museum of Modern Art in New York: one in “Indian Art of the United States” (1941), the other in “Primitivism in 20th Century Art” (1984). In 2006, in Paris, Donald Ellis acquired a different set of Yup’ik masks at auction, each of which was purchased from Julius Carlebach by Robert Lebel, an art historian, the first biographer of Marcel Duchamp and a friend of André Breton. For anyone who has read James Clifford’s account of Surrealist interest in Native American art, these few pieces provide an object lesson in the vicissitudes of value surrounding indigenous arts. According to CNN Online, the Donati Studio Mask just sold to a private collector for more than $2.5 million, breaking the record for indigenous art from the United States sold at public auction. The Winter Antiques Show runs from January 21- 30 at the Park Avenue Armory. See the masks while you can.